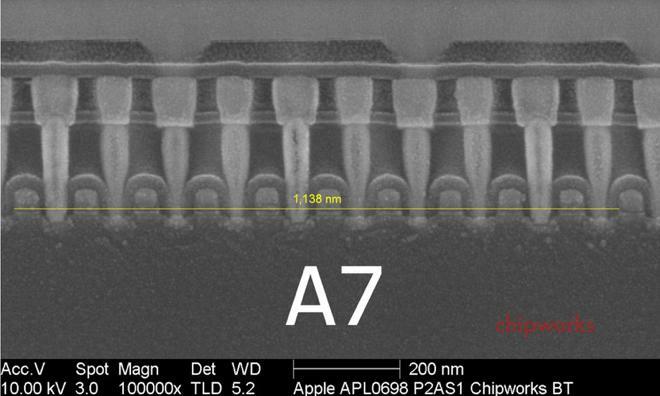 The new silicon found in Apple's iPhone 5s has been viewed under a microscope, revealing some of the secrets of the custom-built A7 processor and M7 motion co-processor. Cross-section of the new A7 CPU. Photo via iFixit. 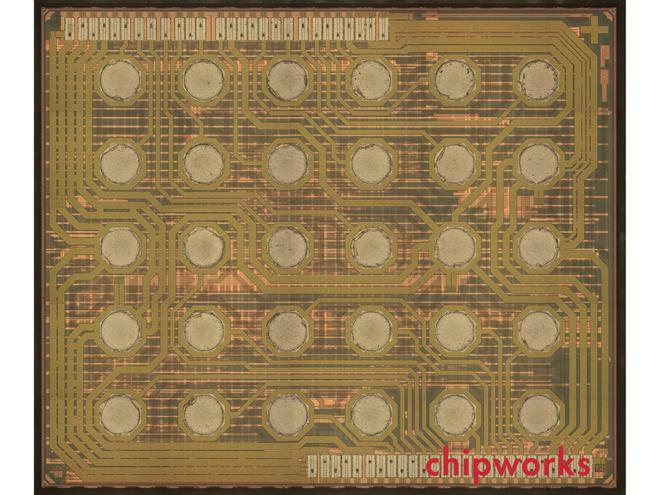 Chipworks and iFixit published the results of their extensive teardown on Tuesday of the A7 CPU, M7 chip, and iSight camera found inside the iPhone 5s. Chipworks was able to take layers off of the semiconductors by blasting them with an "Ion Beam Etcher," then viewing them with a transmission electron microscope. The analysis revealed that the Samsung-manufactured chip is using the company's 28-nanometer Hi K metal Gate process. That's the same process as used by the eight-core Samsung Exynos 5410, which is the flagship CPU found in the South Korean company's latest Galaxy-branded devices. The "gate pitch," or distance between each transistor, inside the A7 is 114 nanometers, smaller than the 123-nanometer distance found in the A6. That allows Apple to pack as much power as the A6 into an area 77 percent as large. But the A7 chip uses an even larger amount of total space than the A6, which means the extra space offered by the 28-nanometer process has allowed Apple to significantly improve the performance of its latest mobile processor. The new M7 motion co-processor. Photo via iFixit. As for the M7 motion co-processor found in the iPhone 5s, Chipworks found that the part is an ARM Cortex-M3 microcontroller. It collects info from a Bosch Sensortech BMA220 3-axis accelerometer, STMicroelectronics 3-axis gyroscope, and AKM AK8963 3-axis magnetometer. The silicon experts noted that collecting motion data with the A7 processor would be "mega-overkill." As a result, the new M7 allows low-power observation of the motion sensing capabilities of the iPhone 5s. Also analyzed was the new iSight camera, revealing the larger active pixel area offered by the improved sensors. The analysis also found that the iPhone 5s features the same Wi-Fi module as last year's iPhone 5, while the new Qualcomm 4G LTE modem runs on a two-chip system with parts from Samsung.